Dementia sufferers living at a care home were only bathed once a month and lived in "disgusting" conditions. 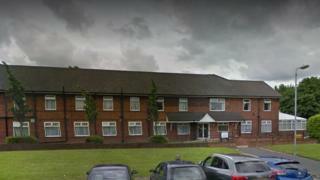 A Care Quality Commission (CQC) inspection in July at Yew Trees in Dukinfield, Greater Manchester, said it was "not safe". Inspectors found nine breaches of health and safety at the home, which has been placed in special measures. The owners said it has made immediate changes to address the issues. The CQC said some residents "looked unkempt" and records showed some people were only given baths or showers once a month, twice at the most, even those who were incontinent. One relative of a resident asked inspectors if they could have more baths "because I have to wash my relative down". A woman who said her late mother lived there for 18 months said it was "absolutely disgusting" and she "kept a diary of incidents but it made no difference". Inspectors found the home was not safe, effective, caring, responsive or well led. Claire Ingham said her mother, who had dementia and died earlier this year, was physically attacked by other residents. Inspectors also said mealtimes were "chaotic" and had been told by a relative a resident lost four stone in weight since being at the home. The relative told the CQC: "We shouldn't have to come in and help out as we are paying for the support." At the time of the unannounced inspection, Yew Trees had 41 residents, the majority of whom have dementia. A spokesman said residents' health, safety and wellbeing were its "utmost priority" and it "immediately put in place a detailed action plan" to address the issues highlighted by the CQC. The two leaders are meeting for the first time in Vladivostok, soon after the collapse of the Trump-Kim talks.